If you're a teacher, you've heard this before. If you're a parent, you've heard, or maybe have even said, this before. As a student, you've almost certainly uttered this phrase in response to the workload assigned by your teacher/s. Why is the phrase so universal among students and the practice so despised? While my thinking on homework continues to evolve, the phrase is approaching a truism for me. Even though my philosophy and practices are still not aligned, I am getting closer to the coherency that I would like to achieve. I had the opportunity to complete my Masters Degree this summer and aside from that achievement, I was able to devote a significant amount of my classwork towards the role of homework in our classroom. I've had a draft post on the topic for some time now, but the topic is so complex that I just never could seem to commit the time needed to address in a way that I felt it deserved. So I'm going to 'eat the elephant' one post at a time, four in total. Start the conversation. I'll try to get people thinking about homework and provide some background on homework, its issuance, tradition, and new thinking on the topic. Tackle the homework issue from a student and home partner perspective. Its impact on learning, personal interests, relationships, and motivation. Look at homework from an Teacher's perspective. What are teachers, administrators roles in homework and how do their attitudes and practices (issuance/grading) impact student learning and motivation. My verdict on the issue for my students. What I will try and do and maintain for the benefit of student learning and motivation. What does homework contribute to student learning? Is it an effective practice and is it based in sound instructional theory? What, if any, conditions need to be met for homework to be a productive practice? What is the social impact of homework? 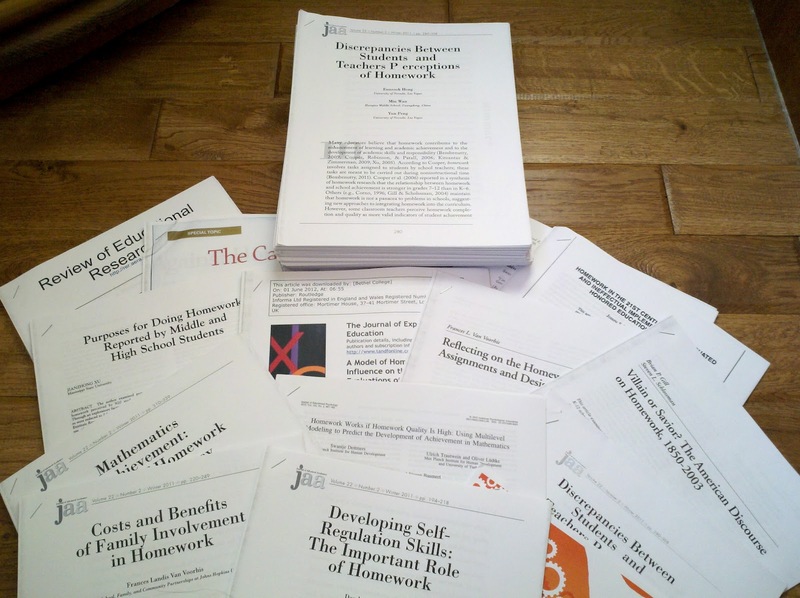 Is the impact of homework the same for all students? Low income youth? Can teachers claim or demand time outside of their classroom? And does homework take away from student creativity or the development of their personal interests? Does homework facilitate deeper home partner relationships and involvement in student academics? Or does it add stress and frustration to students and their home partners? 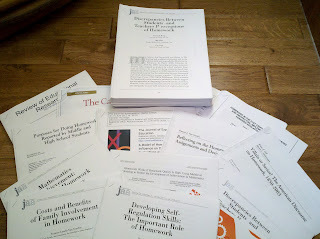 Does homework improve the home-school connection? What in terms of assessment or feedback does homework produce? Is the educational product valuable? Is homework the result of poorly planned lessons or mismanaged class time? I 'killed off' homework last week with my 4th grade kids. We're halfway through the school year and after 11 years of teaching and wondering 'what's this all about?' I decided to do some proper reading on the subject. Thanks to many people in my twitter PLN, I decided to set up 'home learning' instead. Sounds like a trite language trick, but it is far more than that. Goodbye homework, hello choice, negotiation, self-control, autonomy, variety, enthusiasm, learning, diversity, differentiation - happy times. Thanks for the kind words and the encouragement. I appreciate it. Well said! I got to talk with middle school teachers in my district about homework last year and their thoughts echo many of yours. We all read "Rethinking Homework" (Vatterott) together and found many of the ideas in there helpful. The teachers all tried different techniques with varying levels of success. Bottom line: Teachers who didn't call it "homework" or "formative assessment" found that terminology change useful, and teachers who somehow communicated the PURPOSE of homework (and SHOWED the purpose rather than telling) were more successful. Thanks. I know at the very base of homework issuance is a desire by teachers to do what they feel is best for their students, but homework tasks affects a number of things for the student. You're point is well taken and that aligns with some research on grade 8 Swiss students, that found when motivation on the part of the students was high and the purpose of homework was understood to be beneficial by those students, the result was improved effort and completion. I certainly understand the 'not preparing them" argument, but I teach middle school content and students not high school (or higher grade) rigor. I love the choice menu! What a great idea. I also like the creative options that are part of your 'homework'. Gives me something to think about. Thanks for reading. I've found a re-visit of student goals quite enlightening for this process too. Using these to agree upon a 'menu' is really powerful. It's really good that you mention the alignment of student goals with the work they do at home. This combination has been found to have positive results in some of the studies I've read. I'm intrigued by the menu of options, but I need to think about what and how I would use the method for my kids.